Thanks to everyone who participated in the E-Course Giveaway. Of course I wanted everyone to win because I’m a feel-good socialist but…the winner, via random generator, is: #30, Brenna Larson. Brenna, please e-mail me and I’ll get you the password to join the course. Also, if you didn’t win but are interested in participating in the E-Course, the cost of the entire 6-week course is less than one coaching call with Natalie, which is worth something like, I don’t know…your sanity, perhaps…however you want to calculate that. It was a cold and blustery weekend ’round these parts. 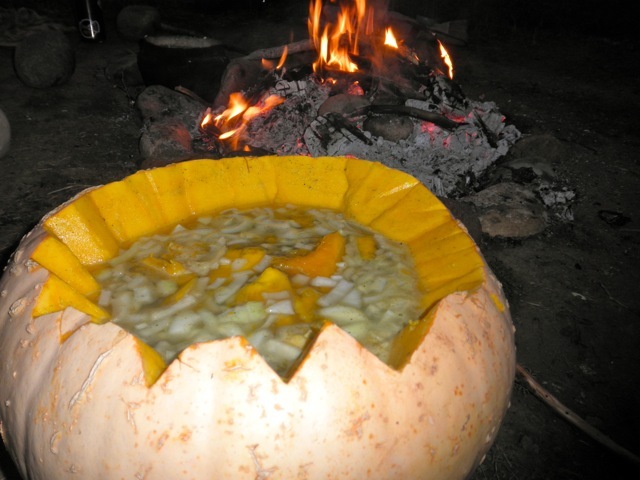 We went to a Stone Soup party, where an entire soup—made inside a pumpkin with items brought by guests—was cooked with hot rocks heated by fire. Have you ever seen this done? It was mesmerizing. It was one of those nights where everyone was just so happy. Dan got to be useful with antler tools and gathering firewood from the surrounding forest, Col snuck flaming sticks out of the fire and then gamely put them back when reminded, I loved spending a cold Autumn night outside, warmed by fire and friendship, and Rose was strategically positioned between my lap and first crack at all incoming potluck dishes. Everything about our weekend was Octobery and sweet. We dug potatoes. 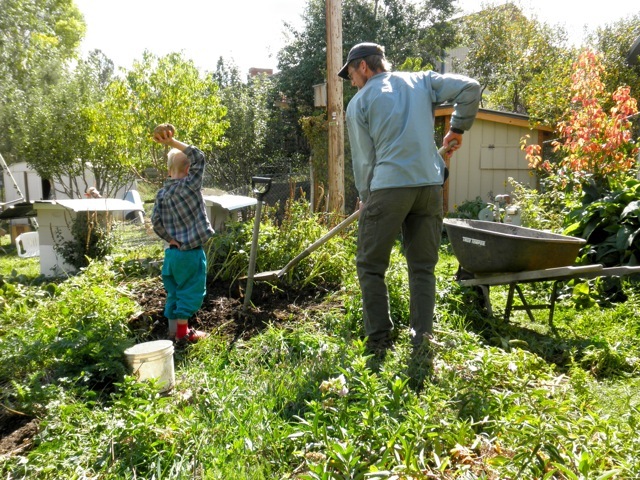 And Col (advocate for all beings, large and small), found several sprouting avocado pits (due to our semi-decomposed compost) in the soil while rummaging around for potatoes. “We have to save these! For Nana! She loves avocados!” Col potted them up and now they’re nestled in our unheated greenhouse dreaming of the equator. 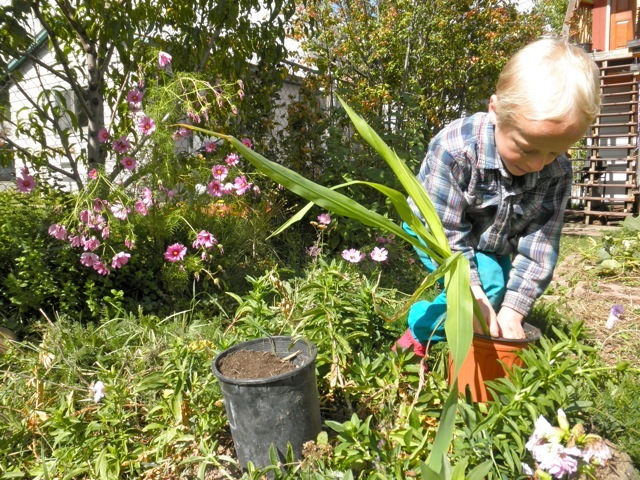 He also threw his body in front of my shovel, saving several volunteer tomatoes and this volunteer corn plant. Arugula! Arugula! It seems to grow like unwanted chin hairs most of the summer, but now it’s one of the stars of the garden! (by virtue of being alive!). To balance out the spiciness I eat it with something sweet (cherry tomatoes, apple slices, balsamic vinegar). Swoon. Also, I made this arugula pesto from Stone Free Farm and it is divine. Col, after playing golf and mowing the lawn with his dad, got to help him paint blended deer brains on the latest deer hide. And now that the frost-tender gems of the garden have been picked, apparently the chickens are getting a few extra cracks at the insects before getting shooed out of the garden. Go girls! How was your fall weekend? A new twist on the old favorite: stone soup. Love it. Magical. I love any new container. And this one is bliss. Sounds like a wonderful weekend! I have never heard of making stone soup quite that way… magical indeed! we dug potatoes too. :) stone soup sounds magical, though i think i’d really like “r.t.”‘s version even better. mmm pecans and chevre. ok dear. you said the soup was mesmorizing. but was it yummy? because i very much like the idea and want to try it. i’m thinking you would modify a bit? how bout lamb and some herbs? and butter? and bacon fat? thanx for your steady onslaught of inspiration! i always love reading you! It was yummy for sure, but I wasn’t kidding about butter and meat (or lamb and bacon fat). Yes on the herbs. And yes on salt! You’ll need rocks that won’t crumble or crack. Our friends got river rocks from along the Pine River. You rotate the rocks from the fire to the pumpkin, so there’s always a rock heating up in the fire and one in the pumpkin heating up the soup. Let me know how it goes. Happy Monday! Your weekend sounded perfect! Anything cooked with/or in pumpkin is alright with me. 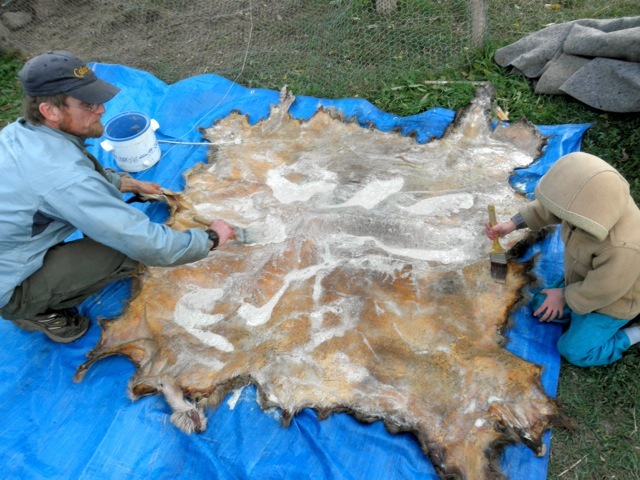 What does painting with blended deer brains do for the deer hide??? I agree with ivey, love reading your blog and the inspiration I get from it. The deer brains, or fat, or liver or eggs is used to penetrate the stiff fibers and assist in the physical process (abrading with an antler tool, etc…) of breaking down those fibers. 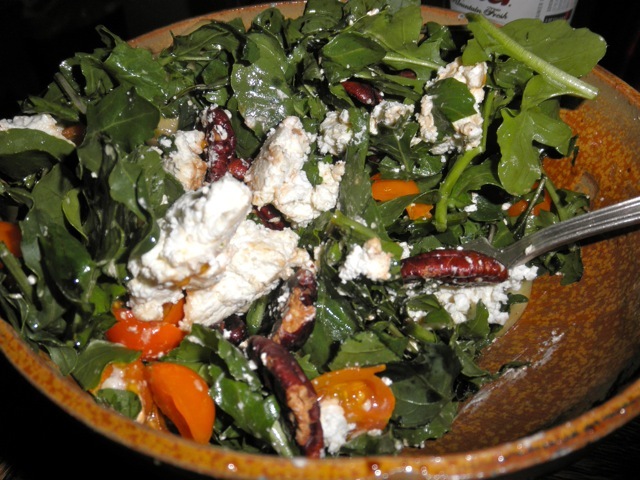 Know what else pairs beautifully with arugula and goat cheese? Oranges. 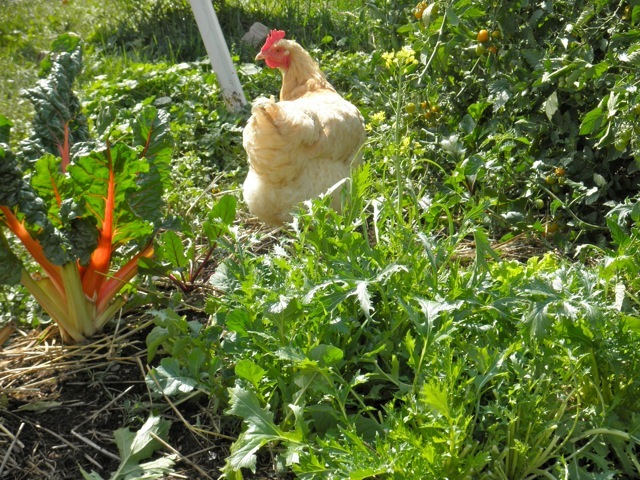 it’s just a shame we didn’t plant any argula–i love it and the lettuce i’ve been buying at the store is just bleh. i feel snobby for saying that but somehow i think you’ll understand. october in berkeley has been a little wild but i love it. yom kippur nearly did me in but we managed to also get some kitsch from a pumpkin patch out in livermore Saturday afternoon. our neighbors across the street just got chickens, too. life is good!! ps. any recipe is always made better by butter and a hunk of meat (forgive the inaccurate paraphrase)! Melissa, Do you guys by chance go to Chochmat Halev (Wisdom of the Heart) in Berkeley? That’s my parents synagogue. Super inclusive, progressive and awesome. antler tools and fire sticks? my four year old lucy would be moving there if she had a taste of that evening. sounds perfect. 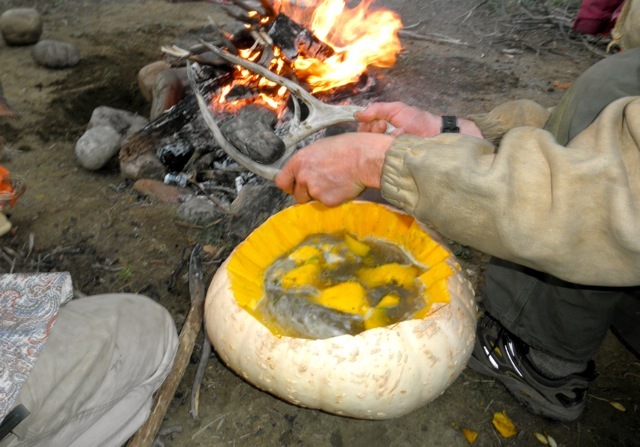 i’m for butter, elk and wild rice in that steamy pumpkin dinner. yummy. all of it. Thanks for answering my question…..